A Gift to Share is a book about generosity. 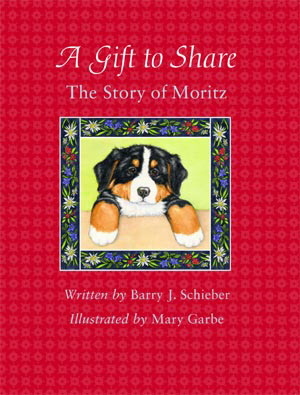 The story follows the adventures of Moritz the puppy as he moves from Switzerland to Montana and learns to be a therapy dog. 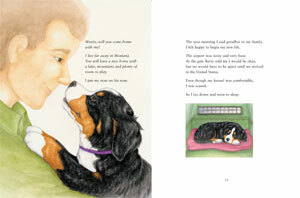 Mary Garbe's beautiful illustrations are so engaging you feel you are walking with Moritz. This is a timeless book for children of all ages. Truly a gift to share. We have a new kids' section - check out Just for Kids on our Get Involved page. Silent Moon Books wishes to thank Eleanor Caponigro, our book designer for A Gift to Share and Nose to Nose. Eleanor's abilities are so natural and refined that I often gasp when I first see her presentations. I hope you will enjoy A Gift to Share and share it with your friends. Read the article about A Gift to Share in the Bigfork Eagle.